Soft and tasty bread is all that we crave for a healthy meal. In order to make good quality bread right at home, bread machines are a quintessential commodity. However, with many bread maker brands on the market, it is near impossible for a consumer to make the right choice. Hence, to make life easier, here is a comprehensive list of the 10 best-in-class bread machines to make fine quality bread and keep the stomach happy. 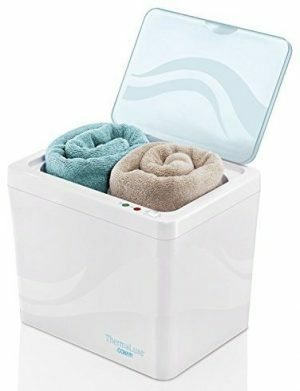 Skip to the best bread machine on Amazon. Made of stainless steel, its collapsible kneading paddle is the first thing to steal your attention. This feature helps you to avoid holes in the bottom of loaves. 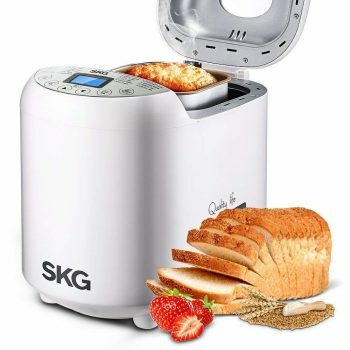 Engineered with the perfect bake technology, the bread maker delivers evenly baked bread along with uniform crust, proper texture, and a mouth-watering flavor. Besides these, the 14 remarkable baking functions allow customization. You can choose your desired type of bread and specify how dark or light you want the crust to be. Further, you can also have gluten-free, low-carb loaves. 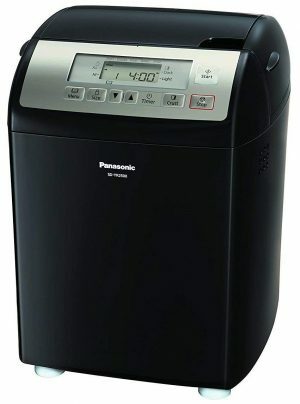 An excellent model from Panasonic, freshly baked bread can be savored in a just a single push of a button. With its intuitive touch-pad control and a large-screen LCD, bread making had never been so easy and simple. Its smart dispensers work automatically in releasing and distributing nuts, yeasts, and raisins. You need not wait for the beep or face the threat of raisins turning into mush. Moreover, unlike conventional bread makers, it has a special setting for preparing gluten-free bread, pasta, and other recipes. 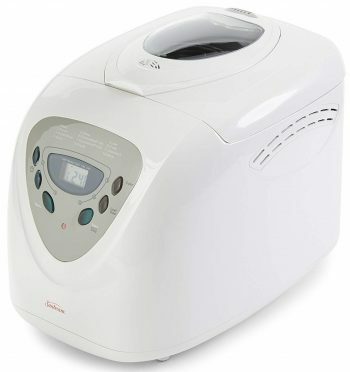 The spotless white 2-pound bread making machine is ideal for large families. 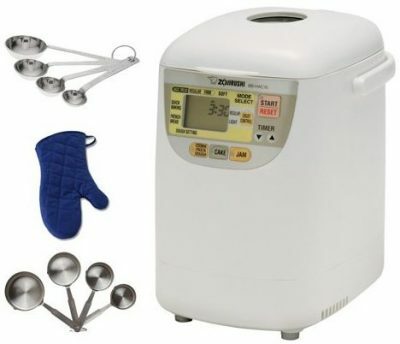 Its 13 special settings enable you to make a wide variety of bread, dough, jam, etc. along with gluten-free food. You can also select your preferred crust color from its 3 options- light, medium, and dark. The programmable baking timer allows you to delay baking time by 13hours. Above all, the Expressbake settings deliver fresh-baked loaves in just an hour. Available in the pure black model, the bread is one-of-a-kind with a wide range of features. Firstly, it emphasizes making healthy and nutritious varieties of food, be it bread or pizzas or just the dough and even jams and cakes. Secondly, it comes with exclusive 12 settings including the gluten-free mode that serves French loaves, Quick bread without yeast, whole grains, etc. Based on your recipe, it has a timely reminder for adding fruits and nuts. Thirdly, its large display screen provides the awesome view of your bread and allows you to control the machine as per your convenience. Another excellent programmable bread maker from Sunbeam, you can now take the pleasure of 12 cooking functions and 3 crust shade options for baking various items. You can control the timer and delay baking by as much as 13hours. Further, the intuitive buttons and wide LCD display facilitates quicker and easier control over baking. Besides these, you can easily remove the non-stick baking pans. Overall, its simplicity, ease, and convenience make it a good choice for baking. The best thing about this model is that it comes with a separate set of measuring cups and spoon; thereby serving as a complete baking unit. Its auto-dispensers reduce your waiting time and effort to bake nuts and fruits. With the machine on, you can concentrate on other household chores. Further, you can choose your desired crust color from light, medium or dark and make customized bread for your family. In addition to 13hour delay timing and a wide LCD screen, the model stands apart by its ‘keep warm’ function. Thus, even if you don’t consume your bread soon after it has been baked, you can still have freshly baked bread at your convenient time. The user-friendly and cutting-edge technology based baking machine provides 15hour delay time, which is two hours more than other models. The ‘keep warm’ module works for 1 hour, something which you don’t get on every machine. Its enhanced sleek design and good quality built increases its longevity and make it handy. You also get a lot of baking recipes to try in this model. The non-stick coated inner pan and handle makes cleaning and maintenance extremely easy. 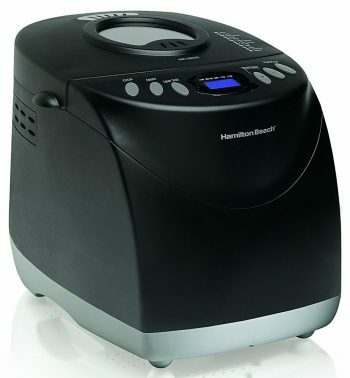 Another marvelous product from Hamilton Beach, the bread maker is known for its 1 easy operation procedure. 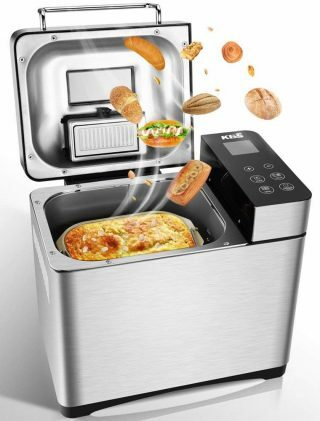 You add the necessary ingredients, select your preferred cycle and push the start button, only to savor your desired taste of bread and even rolls. Besides baking bread, the model is a perfect substitute for pizza makers, cake making machines, etc. The gluten-free setting enables you to have well-nourished bread without any Trans fat. 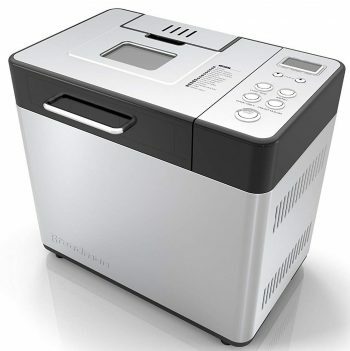 The slim and compact stainless steel bread making model delivers high-quality bread for a healthy meal. The 1-pound bread maker comes with a set of 4-piece measuring cups so that you have an entire baking unit for preparing your favorite items. The programmable model has touch pads using which you can have full control of the baking operation. Its Oven Mitt denim is another special feature that makes it one of the most highly demanded bread making machine. The stainless steel model is unique for a number of factors. Its well-engineered design, enhanced functions, and user-friendly features make it the first choice for domestic purpose. It has an exclusive temperature control technology that delivers the best taste of bread suited to your tongue and healthy for your stomach. Moreover, it is a comprehensive unit for not only baking bread but also yogurt and jam for the entire family. Lastly, the smart auto-dispenser releases nuts and raisins without your manual help. Now that you know about the top quality bread machines, what are you waiting for? Assess your needs, see the features and go for the best one that perfectly meets your requirements. Bread is one of the most preferred food items of the time. Easy to make and even easier to get digested they have been preferred by many people especially in the breakfast. A lot of recipes are present in today’s date which makes use of bread. This is the reason why the demand for bread machines is increasing every passing day. A bread machine is a kitchen appliance with the help of which bread can be baked in easiest ways possible. If you are also looking for some of the best bread machines of the time then the content below is meant just for you. Here, we have enlisted the top ten best bread machines of the year which comprises the most alluring features. So without wasting any time further let us take an insight into them one by one. The bread machine from Aicok is one of the most preferred machines of the time due to its alluring features and wonderful qualities. Not only this machine is durable but also last for a long period of time as it is made up of stainless steel. With its multiple functionalities, it can make us of 19 programs which can work with it and gives a result much faster and quicker than the other competing brands. Due to the presence of LCD screen, one can visualize the whole process of making of bread easily. The bread machine from West band it’s yet another great product which comprises alluring features and worthy specifications. Owing to its light weight of 2.5 pounds it is easy to use and carry anywhere. It can make 3 different sizes of bread which are 1.5 pounds, 2 pounds and 2.5 pounds due to which it is liked by all. The different settings of the machine make it available for making bread like gluten-free, basic ones and that of wheat as well. Hamilton is one of those brands which is the most reliable and trustworthy when it comes to kitchen appliances. With the capability to make bread of 2 pounds it can make use of its gluten-free settings while preparing the bread and this is feasible for all. 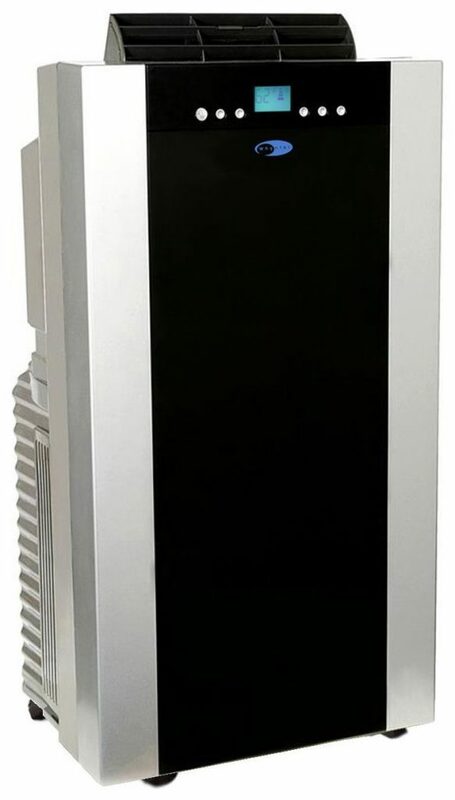 Coming in the dimensions of 12.2 H x 14.13 W x 10.43 D, it has a large display which gives a digital view and comes along with a delay times as well. being dishwasher safe it is a product worth liking. 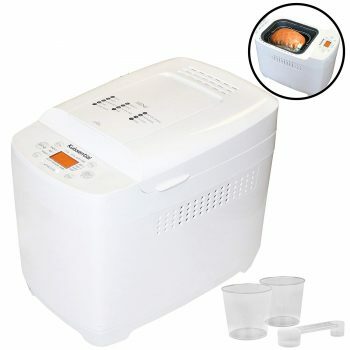 The bread machine coming from Zojirushi is yet another great product to look upon. The best and the most alluring fact of this machine is it can be utilized to make cakes and pastries as well other than bread. Within the shortest time, it can bake the dough for cookies and pasts as well which make this machine all-rounder. Due to the presence of timer, the chances of getting the food overcooked or burn becomes completely nil. Coming in the dimensions of 8-1/2 x 11-1/4 x 12-1/4 inches there is a warranty of one year associated with it. T-Fal makes some of the great electric appliances among which bread machine is one. Since it can be programmed as per the need of the user the chances of making great bread elevates. It can bake a wide range of bread which comprises not just the gluten free but also super rapid and rapid sweet bread. The nonstick coating gives it a great look and makes sure that the food will not get burnt at any cost. This also helps in an easy cleaning. The large display which is digital and LCD gives a clear view of the settings. Made up of stainless steel it comes along with a recipe book. Cuisinart is well known for making great kitchen appliances and bread machine is no exception. Since it can be easily programmed one can make use of it to make a wide range of bread and dough. The best thing about the machine is the speed of the fan which can also be adjusted to make the bread just the way the user requires. It can give three different colors to the crust and make three different sizes of loafs. Yet another product is again from Zojirushi which excels in every feature and thus scores a good number of the users. With the help of its setting for making gluten-free loaves of bread a large number of people are opting it for others. It bakes the loaves in rectangular shapes and can make use of organic ingredients while manufacturing. The use of high-quality materials in the making of the machine makes it durable an long lasting. Since there are two different kneading blades present in the machine the dough gets kneaded properly, to make soft and spongy loaves of bread. 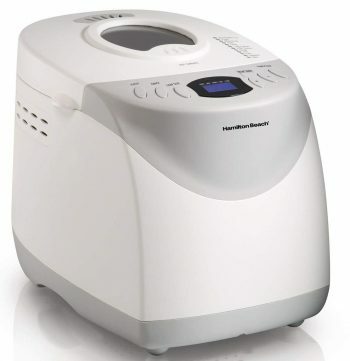 The next bread maker is from Sunbeam which is yet another wonderful product present at the time. There are around 12 different settings which can be utilized to make the soft and crusty bread in different shades. From the touch control panel to the large LED display, everything about the device is wonderful making it the best of the time. 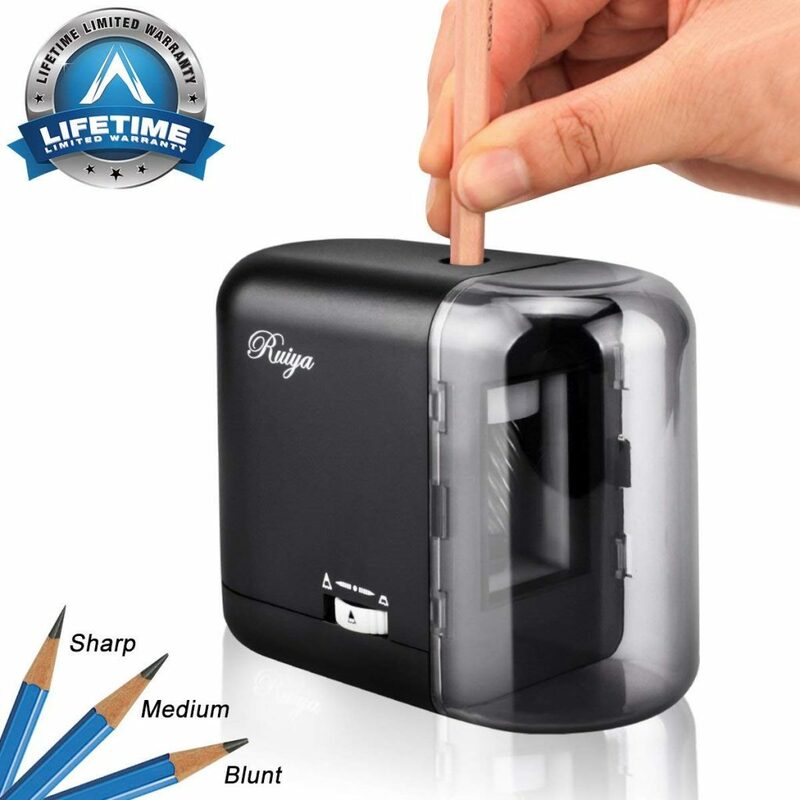 Coming with a warranty of one year it is a great product to splurge upon. The next machine comes from Cuisinart again which is considered as so far one of the most reliable and authentic brands making the bread machines. With its variable programming, it can make bread in three different sizes and shades. One can make three different crusts as well with the machine and thus prepare the bread of choice. Coming with every essential accessory required while making the bread this is one potential product to ponder upon. 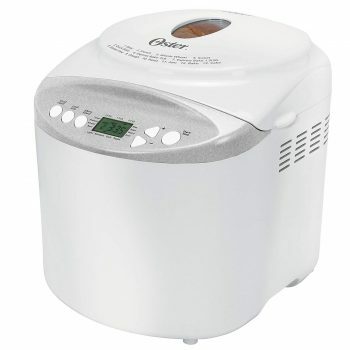 The best in the category of bread machine comes from Oster. People have loved the results which come from Oster while making the loaves of bread and therefore it becomes the best out of all. Since it can make bread with the size of as big as 2 lbs, it seems a perfect choice for families which comprises a large number of members. There are 12 different settings to make the bread which come in different shades and crusts. The large LCD display makes it worthwhile to spend money. These are some of those bread machines which are loved by people due to the ease they endow to the user. From the durable materials used in their manufacturing to their user-friendly interface, everything about them is superb making them the best kitchen appliances in the category of bread machines. So get the one which suits your preferences the most and enjoy baking the bread on your own.